I have been canning for about 10 years. When I started, it was just once a year - I would pick strawberries and make one big batch of jam and can it. This was the recipe and the process that brought be back to childhood...back to the kitchen with my mother and grandmother hoisting me up over the stove to stir the thick pot of strawberry jam as the intoxicating sweet smell filled the room. When I made jam, it made me feel so connected to that memory and to them. After awhile. I started to realize that there were so many more things that I could do with that big beautiful canning pot. I started to experiment with other recipes and I started to find all kinds of new inspiration at the local farmers market. Canning started to become more than just a connection to a memory, but a connection to food and a connection to eating seasonally. In recent years, as the popularity of canning has risen, it has also given me a community of wonderful and inspiring people that share my love. I really want to add you to that community and that is why I am doing this series on my blog. People tell me often that canning is just too intimidating to try. I know it does seem like a lot of information at first. Remember that it's just like any other new craft or multi-step recipe you've done before - there are just some new terms, techniques and steps that you need to learn, but once you get those down your possibilities become limitless! Over the next few weeks, I will share the basics of canning with you - the terms, the hardware, the process, and the troubleshooting...and of course the amazing recipes you can make! I really hope that you will get inspired and give it a try! Let's start with some bare bones basics, shall we? There are quite a few words that will often come up in any canning recipe and the first step is being able to decode those words. To help, I created a small dictionary of canning lingo that you might come across. I also included a handy guide to help show you the common different types of canned goods. The intent here is not to encourage you to memorize all these words, but rather to give you a point of reference when you need it. A combination of vegetables and/or fruits, spices and vinegar cooked for a long period of time to develop favorable flavor and texture. Usually with a sweet-sour flavor. A soft spread similar to jam, that is made with at least 2 kinds of fruit in addition to nuts or raisins. A spread made by crushing or chopping whole fruits. Jams are thicker than jellies and tend to contain chunks of fruits. A spread made with only fruit juice rather then the whole fruit to form a smooth gel consistency. A spread that contains pieces of citrus fruit and peel evenly suspended in transparent jelly. A spread in which fruit is cooked with sugar to the point where large chunks of fruit or whole fruit (usually berries) are suspended in a syrup base. The texture of preserves is not as smooth as jelly or jam. A pickled product prepared using chopped fruits and/or vegetables cooked in a seasoned vinegar solution. A soft spread made by slowly cooking fruit pulp and sugar to a consistency thick enough to mound on a spoon and spread easily. Spices may be added. A creamy spread made with sugar, eggs and butter, generally flavored with citrus juice and zest. Curds are often not safe for waterbath canning because of their dairy content, so be sure to use a recipe specifically designed to be canned. A powder made from natural acid derived from citrus fruits. Citric acid is often used in recipes to increase the natural acid in the recipe in order to make it safe for canning. Lemon juice or lime juice may also be used for the same function, but each have their own PH level. The degree to which screw bands are properly applied to fresh preserving jars. Use your fingers to screw band down until resistance is met, then increase to fingertip-tight. Do not use a utensil or the full force of your hand to over-tighten bands. The unfilled space in the canning jar between the top of the food and the lid. Each recipe will specify the amount of headspace needed. This headspace is needed to allow for expansion when the jars are heated and also to form a strong seal once the jars are cool. An absolutely airtight container seal which prevents reentry of air or microorganisms into packaged foods. A food with a pH level of 4.6 or lower. Most tomatoes & fruits (except figs, Asian pears, melons, bananas, dates, papaya, ripe pineapple, persimmons) are naturally high in acid. Citric acid, lemon juice, or vinegar can sometimes be included in a recipe to help raise the acidity. Fermentation can also add acidity. Only high acid foods are safe for waterbath canning. A food with a pH level higher than 4.6. Vegetables, meat, & seafood are all low acid foods. These are foods that are easier for bacterica to thrive in and need to be processed in a pressure canner to safely perserve them. The use of a pressure canner to heat-process low acid foods. The pressurized steam inside the canner allows the food to reach higher temperatures and thus can kill the harmful bacteria that can be housed the the low-acid food. Pressure canned food also must be processed for the specified amount of time on the recipe. The time in which the filled jars need to remain in the waterbath or pressure canner. The processing time is specified in most recipes and can have variances depending on your altitude. The amount of processing time depends on many factors including the acidity level, size of jar, and type of food. The process time allows every bit of the jar to be heated to the sufficient temperature. Repeating the heat processing of filled, capped jars when a lid does not seal within 24 hours. The original lid must be removed and the food and/or liquid reheated as recommended by the recipe. The food and/or liquid must be packed into clean, hot jars and covered with a new, clean lid with the screw band adjusted. The filled jars must then be reprocessed using the preserving method and full length of processing time recommended by the recipe. The evidence that a food product has not been completely rid of microorganisms. If microorganisms are present, the nutrients in the food product will allow them to grow and multiply. Spoilage occurs when food products have not been processed correctly. Signs of spoilage include broken seals, mold, gassiness, cloudiness, spurting liquid, seepage, yeast growth, fermentation, slime and disagreeable odors. The process of killing bacteria. Achieved by heating empty jars to a high temperature prior to filling them & then heating them again once full. 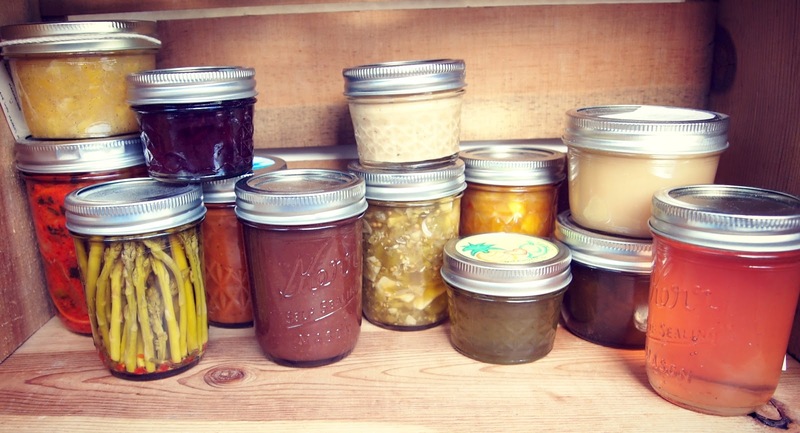 This list is of course very incomplete, there are limitless possibilities when canning. This is really just the beginning, so stay tuned for more canning basics, recipes, and even a giveaway!! ahh i used to make jam with my grandma too! i need to look into canning on my own now. I'm so excited that you are doing this series! I have experimented just a tiny bit with canning, and I would love to learn more!